(2014). Nanotechnology in Wood-based Composite Panels. International Journal of Bio-Inorganic Hybrid Nanomaterials, 3(2), 65-73.
. "Nanotechnology in Wood-based Composite Panels". 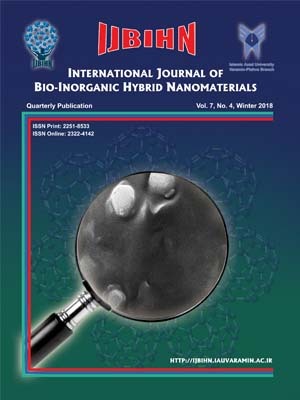 International Journal of Bio-Inorganic Hybrid Nanomaterials, 3, 2, 2014, 65-73. (2014). 'Nanotechnology in Wood-based Composite Panels', International Journal of Bio-Inorganic Hybrid Nanomaterials, 3(2), pp. 65-73. Nanotechnology in Wood-based Composite Panels. International Journal of Bio-Inorganic Hybrid Nanomaterials, 2014; 3(2): 65-73. Wood is a naturally renewable material with both continuous and isolated pore systems. Wood-composite panels have the privilege of offering a homogeneous structure to be used as constructional and structural materials. However, its nature makes it susceptible to biological wood-deteriorating agents, water absorption and thickness swelling, fire, etc. Using nano-materials are very easy in the wood-composite industry due to the possibility to apply nano-material suspensions as in-process treatment. An overview of the research project carried on applying nano-materials in wood-composite panels proved numerous potential applications of nano-technology in this industry. The use of metal (nanosilver, nanocopper, and nano zinc-oxide) and mineral nanomaterials (nano-wollastonite) with high thermal conductivity coefficient helped improving thermal conductivity and better cure of the resin, resulting in a significant decrease in hot-press time, an improvement in physical and mechanical properties, as well as a decrease in gas and liquid permeability values. The water repellent property of silane nano-particles prevented the penetration of water and vapor into wood-composite matrix, resulting in a potential increase in the service life of the parts used in the furniture or structure would significantly increase. The applications are expected to rapidly expand and cover many other areas in the near future.